Is Earth Defense Force: Iron Rain on Xbox One or PC? Earth Defense Force: Iron Rain has arrived on the PlayStation 4, but can players expect an Xbox One or PC release? The latest Earth Defense Force game has released in the form of EDF: Iron Rain. Currently available for the PlayStation 4, gamers keen on other hardware are left wondering whether or not the latest Yuke's release will be dropping onto the PC or Xbox One. Is EDF: Iron Rain on PC or Xbox One? Earth Defense Force: Iron Rain is not currently available for Xbox One or PC. 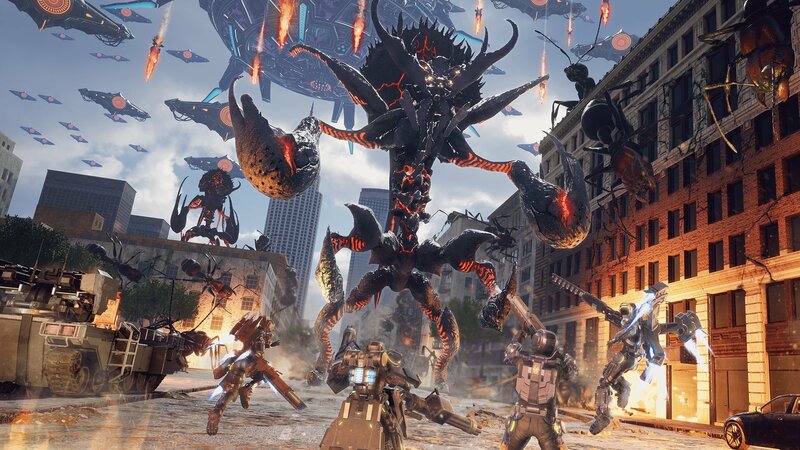 Developed by the team at Yuke's, the latest Earth Defense Force game was released exclusively for the PlayStation 4 on April 11, 2019. Of course, that's not to say that the game will never make its way to other consoles. Two past games in the series, Earth Defense Force 2017 and Earth Defense Force: Insect Armageddon, were released for Xbox consoles. However, past series entries Global Defense Force, Global Defense Force Tactics, and Earth Defense Force 5 were all released as PlayStation exclusives. Of those aforementioned titles, only Earth Defense Force: Insect Armageddon and a remake of Earth Defense Force 2025 ever made their way to the PC. So while players may be holding out for a PC port of Earth Defense Force: Iron Rain, such a release is unlikely to happen. An Xbox One port of EDF: Iron Rain is more likely to release than a PC port, but considering the series' history of releasing EDF games as PlayStation exclusives, both are still relatively unlikely. Sorry folks: Earth Defense Force: Iron Rain is not currently available on the Xbox One or PC. It's certainly possible that EDF: Iron Rain will release for the PC or Xbox One in the future, but going by the series' history, we're not inclined to hold our breaths. Until D3 Publisher or developer Yuke's speak up on the matter, Earth Defense Force: Iron Rain is likely to remain a PlayStation 4 exclusive game.